Had a great night at the Lanoie’s celebrating Linea‘s birthday. Happy birthday, Linea! And part of that birthday was a Dale Nikkel house concert. Originally the house concert was planned for our house, but several weeks ago, Linea’s husband, Leo, came up to me after church and told me to save March 14 for Linea’s birthday. And I said that I was going to tell him the same thing for this house concert. <sing-songy voice> Cooooonfliiiiiiict!</song-songy voice> The problem was that the people that would most likely be attending Linea’s birthday party were also the bulk of the people I was planning on inviting to the house concert. Dale was incredibly kind and understanding in this whole process. I apologized to him for having so few friends that I couldn’t gather up enough people from outside our church group to make the house concert work (he was looking for about 30 people), and he said not to worry: he’s played all kinds of shows for all kinds of people, including to a couple of stranded truckers (ah, the struggling artist!). Anyway, the concert was a hit. Dale and his friend Kimbal Siebert were fantastic. Everybody had a great time. 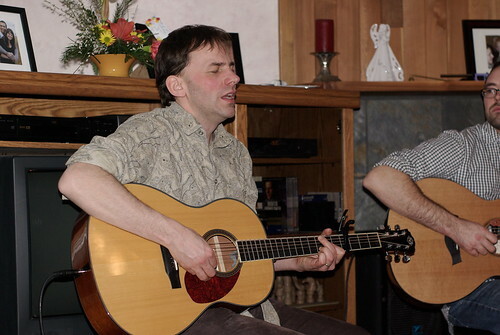 I would definitely have a Dale Nikkel house concert again, any time. And if you have a chance to go to a Dale Nikkel concert, do it. You will not regret it. Also: buy his new CD. It’s available on iTunes (or will be shortly). Better yet, order a hard copy through his website, because he’ll get a better cut of the purchase. I haven’t had much chance to listen to the CD (I only bought it last night), but I daresay it’s his best yet (although, to be fair, I haven’t given his previous CD a fair shake yet–I didn’t buy it that long ago). Several people have asked how I know Dale. I know him through his brother, Chris. Chris and I were tree planting partners for two or three seasons–somehow our foreman Kyle saw us as a perfect match in terms of personality, etc. We became friends (and we were good planting partners). Chris is a poet, published and all. 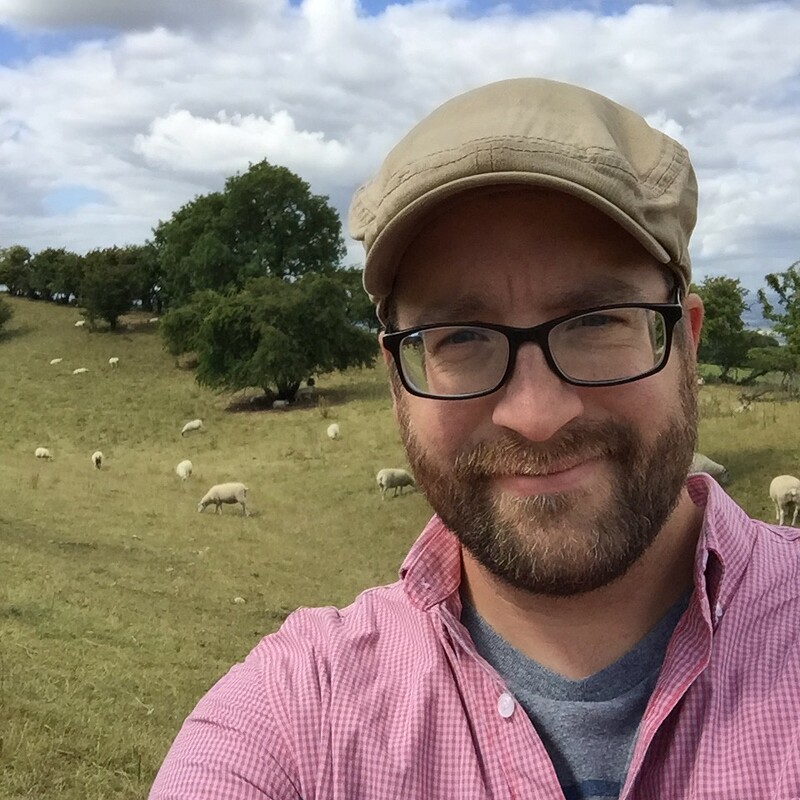 I haven’t seen Chris in nearly a decade–he has split his time between Canada and Ireland–but we send annual, sometimes semi-annual email updates. Somehow we’ve managed to click even after all these years. All that to say…I met Dale once when we stopped at their Edmonton home on our way to Prince George for another tree planting season. Then I met him at one of his concerts in Saskatoon several years ago. Later on he called me up about doing a house concert, which fell through. This one almost did, too. The Nikkels–at least, the two I’ve met (oh, and a cousin)–are fine, soft-spoken folk. 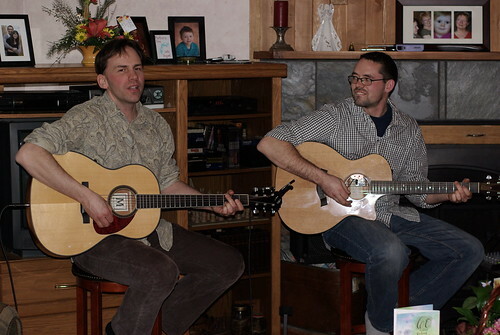 This entry was posted in Arts & Entertainment and tagged Dale Nikkel, house concert, Kimbal Siebert on March 15, 2009 by Marc. Glad it was fun for you. It was great. I also found it fascinating how he captivated Kieran and Zaka. I would host a concert by him again anytime too.